Posted April 11, 2019 by Battle Creek & filed under Paintball Tips. Getting ready to play paintball for the very first time? 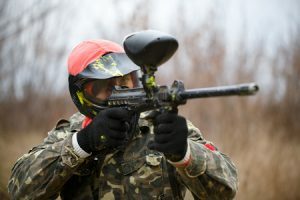 Your first game of paintball might seem a little intimidating, but the truth is you don’t have anything to worry about. Just follow these helpful tips and you’ll be sure to have a blast. Dress in layers if you’re afraid of getting hit by paintballs. If you’ve never been hit by a paintball before, you might be concerned about whether or not it will be a painful experience. Paintballs can sting a little bit, depending on where you get hit, but in the heat of battle you’ll probably hardly feel a thing. If you’re still worried about it, though, a heavy sweatshirt can give you some additional peace of mind. Regardless of your experience level, it’s important to keep your face covered with a protective mask at all times. While getting hit with a paintball isn’t nearly as painful as some people make it out to be, a paintball can do some serious damage if it hits you in the face. It’s always best to keep your face mask on until the referees tell you it’s safe to remove it. Strategize with your teammates before taking the field. One of the reasons paintball is so much fun is because it gives you the chance to coordinate with your teammates to maximize your chances of success. Before you take the field, talk to your team and come up with a rough plan for how you’re going to approach the match. This can give you a tactical advantage and help to build camaraderie among your teammates. Chances are, you’re not going to be the best paintball player on the field when you play for the first time. Don’t let it get you down! The goal isn’t just to win; it’s to have fun and blow off some steam in the process. Treat your mistakes as learning opportunities, and do your best to relax and have a good time. To schedule your next game at Battle Creek, give us a call or contact us online today!